O2 Lounge is a stylish bar located on the top 11th floor of the luxury Ritz Carlton Hotel in Moscow, right next to the Red Square. The O2 Lounge probably offers the best sushi and sashimi in Moscow under a magnificient glass dome with breathtaking panoramas of the city. A variety of meals and cuisine is served from the O2 Lounge grill...such as juicy steaks, delicious seafood and succulent kebabs. A stylish bar serves tasty world-famous cocktails. With an endless choice, the O2 Lounge also has a vodka somelier . The summer terrace at the O2 Lounge is as chic and stylish as it gets...even voted the best summer terrace in the Russian capital. 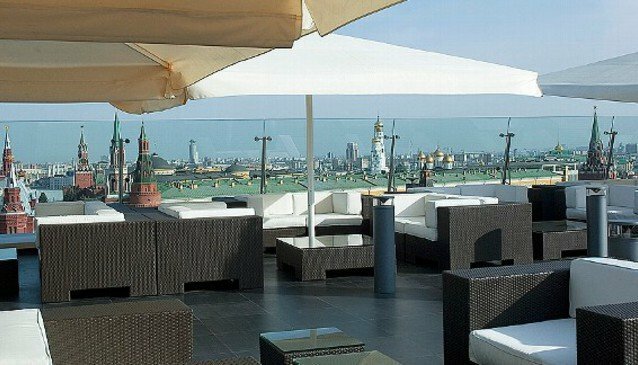 Sit-back in a lavish setting and enjoy the vast views taking in the Kremlin, the Red Square and beyond. Obviously the best does come at a price in Moscow.